James Hohmann of the Washington Post's Daily 202 joined us on Thursday, March 17 to discuss Trump's Mega Tuesday and Obama's nomination of Judge Garland to the Supreme Court. @barryzuckercorn: Hey James! Love reading the 202 every morning! What are your thoughts on the likelihood of Trump getting to 1,237 before the convention? Hi Barry, Thanks for reading! I think the odds are greater than 50 percent that Trump gets the delegates necessary to lock up the GOP nomination before Cleveland. He is very hard to stop at this point. But a convention is the only way to do it. @dicksen: Piggy backing off the question above- what would happen to the Republican Party if Trump is denied the nomination in a floor fight? If Trump is denied the nomination in a floor fight, there will be mass chaos. Think about the thousands of Trump supporters in the arena at Cleveland. It's a security nightmare for Capitol Police. Considering the anti-Trump Members who will be there. @hawkes912: Chance Merrick Garland gets confirmed? He seems dead on arrival now. But I think the chances are pretty high Republicans would try to confirm Garland during a lame duck session if Clinton wins in order to avoid a more progressive and younger justice getting on the bench next year. @f&#k.sjl: Is there any chance Obama pulls Garland if Clinton wins? Obama pulling Garland, NO WAY! A lot of liberals have emailed me about this scenario since 202 popped this AM. But he's Obama's pick/legacy. And the president will want his guy to get on the court. Even/especially in a lame duck. @f&#k.sjl: I was one of those liberals. Is there real political oomph behind a conservative candidate running third party to tank Trump if he wins the nomination? I think there will be more and more buzz. Someone will run as a third party alternative to Trump. It all comes down to WHO. My gut tells me it won't be someone w/ clout who has future ambitions because no one wants to be a Nader-like spoiler. I think there will be a lot of calls for someone like Rubio or Ben Sasse or Mitt Romney even to run. But all three of those guys would not go through with it. Chance for humiliation -- and spoiler effect -- is way too high. @horsey.wofford: Hi James, polls consistently show that voters don't trust Hillary. Is her refusal to release her transcripts making that worse? Why is she dragging it out? What's the inside scoop? it's a problem for her in that it plays into broader narratives that she's A) secretive and B) overly cozy with Wall St. I don't think it's actually costing her votes though. Just a data point. Hillary's paid speeches to Goldman aren't really an issue if Cruz is the nominee because his wife comes from Goldman. If Trump is nominee, she can reply that he needs to release his tax returns. If Kasich is, she can note he worked for Lehman Bros. I think she will probably avoid releasing them. If she does it will be a Friday night during, say, the Olympic ceremonies. They are more potent in a Dem nominating contest with Sanders hitting her from the left than in a general election. @wee.lumpkin: It's okay to ignore horsey. What are the electoral implications if any of ignoring Obama's SCOTUS nom? Whose seat does it put in play? Hi Wee, the short-term downside of Obama's Garland bet is that it does not gin up the Democratic base nearly as much as the vacancy activates the conservative base. I think it's a data point in the Democratic narrative that Republicans cannot govern. Two thirds of Americans want confirmation hearings in a WaPo poll we ran last week. BUT there is little intensity/passion about the issues. Garland has a conservative streak on the DC circuit when it comes to criminal justice reform. He sides more with the Feds than his Dem colleagues because of his background at the Justice Dept. This will upset the Black Lives Matter movement. Garland also does not have a long paper trail on abortion issues. Many liberal groups are frustrated that Obama offered an olive branch and didn't swing for the fences. Top D operatives feel like O missed an opportunity to re-activate his coalition. @webb.mcgrath: Do you prefer Cruz over Trump? I don't have a favorite. I don't even vote so that I can remain 100 percent neutral/objective/fair. @f&#k.sjl: So you think Garland was chosen because Obama actually wants him on the court? Yes. I do think Obama actually wants Garland on court. I think he opted not to make the most political choice. And I think as a Harvard educated lawyer he was sensitive to the criticism that he might pick someone to appeal to a certain constituency. I think The White House celebrated last week -- before we knew who the pick was -- when Sen. Hatch told Newsmax that Garland would be a great pick but that Obama would never choose him. @mckean298: In today's Daily 202 you mentioned that conservatives acknowledge that they have a limited list of complaints about Garland. Has your newsroom discussed what they think those limited complaints would be if he actually got a hearing? Hi McKean, Guns is the biggest one. It's more complicated than most coverage would suggest, but he basically would have let the DC ban on guns survive in the Heller case. @james.hohmann: This has been terrific. Thanks for the great questions. And thank you everyone for your public service. 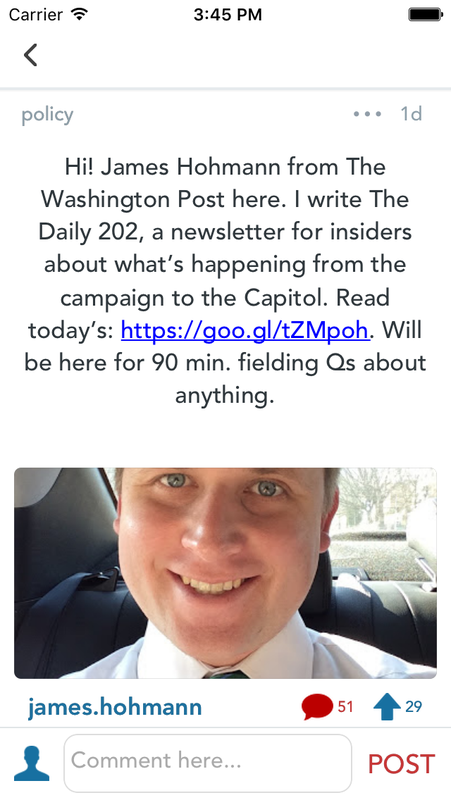 Please subscribe to my 202 if you don't already: wapo.st/daily202.